We have five ice huts over 50 feet of water within walking distance from Camp. Whatever your favourite outdoor activity - snowshoeing, cross country skiing, ice fishing, deer bow hunting, photography or relaxing inside a nice cabin beside a warm fire reading a book - we have the accommodations, equipment and conditions to meet your every need. Join us this winter and be a part of the winter fishing experience. During the transition from fall to winter we have the winter deer migration at our back door. Whether you're a nature photographer or a bow hunter, we can provide the opportunity to shoot with a camera or with a bow. The duration of the migration of deer from north and west to the Loring Deer Yards is dependant on the weather and can last as long as from late November to late December. Keeping up with the current migration population requires daily observation on my part to keep you informed of the best time to visit. If either of these activities interests you, email me and I will keep you posted on the start and finish of the deer migration. We have something that you've probably never tried before - a guided day trip to my log cabin trap line outpost camp. Nature's quiet surrounds the Little Pole Camp which is located in the interior of my trap line. We have the equipment, knowledge and miles of trap line trails to explore and you can see for yourself what nature has to offer in the outback bush land. As I mentioned earlier, we are located on the very edge of the famous Loring Deer Yards. 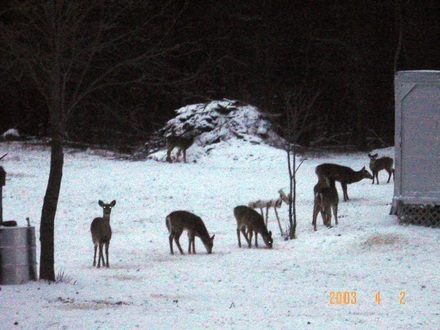 The view from a window or a short snowmobile ride can give you a look at many deer in their natural environment. Wolves are also a part of nature's plan and can be frequently seen running across the lake. However I am all up to the guided tours to and from my Little Pole Camp. 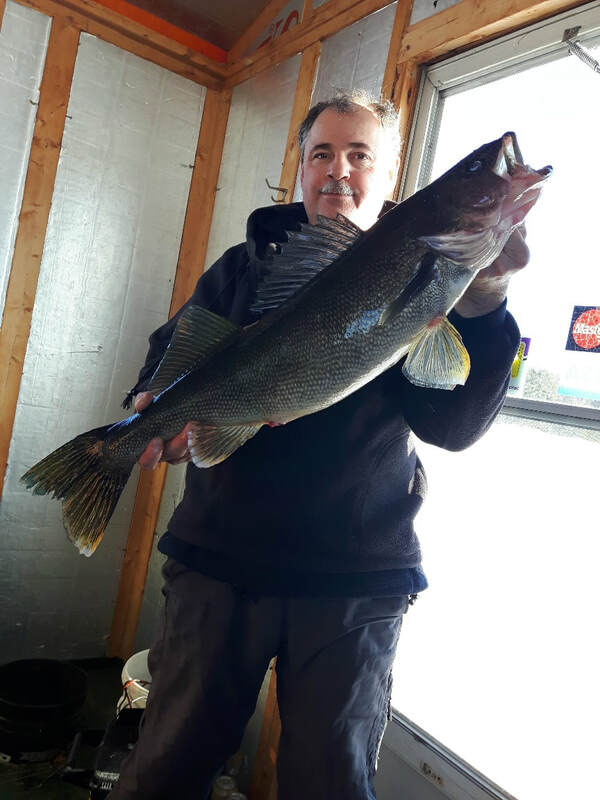 For most folks, it's the winter ice fishing that brings them to Camp. Our main fishing spots are within walking distance in front of the Camp. Having said that, transportation is always available. The fishing huts have a 4 person capacity and are propane heated. An extra day - either Thursday or Monday - can be arranged at an additional cost of $25.00 per person. 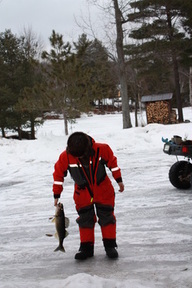 There is still time to get in on the winter ice fishing experience. Book early and get your choice of dates. Cottage #8 now has a Ski-doo ski scar. Moral of the story...check throttle before starting! 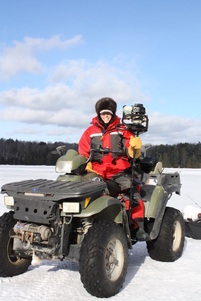 It is our mission to provide our clients with a positive experience @ MLPC on Lake Me Me Sagamesing. Your feedback is important to us. I am always looking for ways to improve our camp and services.